HAVE YOU EVER GONE TO THE BEACH and been totally unprepared? You go there happy, but leave burnt, tired, hungry, and dehydrated. Yeah, I think we all have had that at least once, but with these five essentials, you will be totally prepared. Get there happy and leave happy. Nothing is worse than going to the beach and not having any water. You are surrounded by crisp, cold, blue water, BUT not the kind that can save your life! Hydrate or die! Water is the number one essential for the beach because laying in the hot sun all day long and swimming in the salty ocean, really dries you out physically and mentally, so drinking water is key! Water, water, water! Safety first! Sunscreen is number 2 on my list because getting burnt is not good. Have you ever been out in the sun and you just could feel yourself burning and your skin turning red? Don’t say no because you’re lying. Ultraviolet (UV) radiation from the sun is number one cause of skin cancer, so don’t say I didn’t tell you so! Stay safe, stay healthy, and wear sunscreen. While we are on the subject about the sun, sunglasses are the number 3 essential to protect your eyes from the UV rays of the sun. Your eyes are very sensitive, so the brightness of the sun, reflecting off the sand and water, can damage your eyes easily. Therefore, instead of going blind, just wear sunglasses. Plus, they look awesome! These are necessary and its okay if you bring like 5 towels just for you because, like I said, they’re necessary. 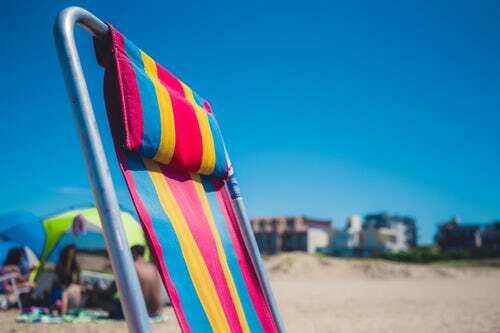 Beach towels are a protective layer from you and the sand because we all know it’s a super uncomfortable feeling when your wet and covered in sand. It’s best to have a towel to lay/sit on, one to dry off with, and an extra just because. They are made thinner for an easy, sand shake off and to dry faster. I will say it one last time, towels ARE necessary. If you’re like me, then you’re always hungry. It doesn’t matter the time of day, you could always eat. Even if you just ate, you could eat more. 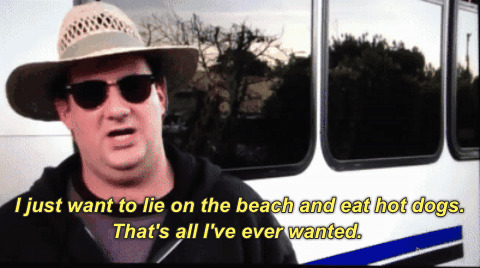 So, food/snacks are crucial for a great beach experience. Avoid packing any dairy or frozen items that will melt, unless you’re going to bring a cooler, but even that can get warm. Items like chips, pretzels, fruits, veggies, sandwiches… MMM sandwiches… Sorry, back on track, are great to bring with you and can last in the sun. Having these top 5 essentials for the beach will make for a great experience. You will be hydrated, you won’t be hungry, you will be comfortable, and you will be protected from the sun in more ways than one. So, lay back, relax, and enjoy your vitamin sea.